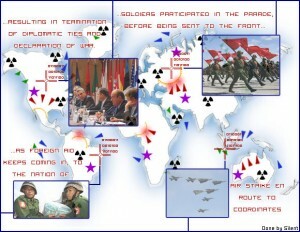 Cybernations is an online browser based nation simulation game. You control all aspects of your nation, from Government type, National Religion, ECT. You build up armies, make trade agreements with nations, and attack others. All while keeping your nations population happy. The interesting thing about this game, is how certian military actions, can effect the whole planet, and not just the nation you are attacking. If you have some free time check it out. It is not a very time consuming game like some other games out there.